Improving individual and institutional capacities as well as strengthening cooperation among relevant agencies is key to policy integration. The Thai-German partnership on climate change is supporting Thailand with the expertise and tools. 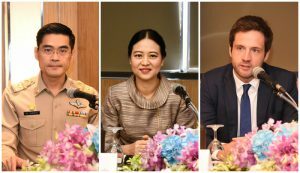 On 8 October 2018, the United Nations’ Intergovernmental Panel on Climate Change (IPCC) released a report highlighting the much-needed actions to keep temperatures between 1.5 C and 2 C. On the same day in Thailand, more than 40 government officials from the Ministry of Natural Resources and Environment (MNRE) learnt about climate change knowledge and approach to aligning sectoral plans with national strategy and climate change master plan. As the focal point for climate change issues, the Office of Natural Resources and Environmental Policy and Planning (ONEP) under MNRE is mandated to initiate and execute climate policy at all levels. At the central level, MNRE officials are key and indispensable implementers to help accelerate the climate policy implementation in the country. With the mandate of propelling national environment policy and supporting the policy integration efforts, a common understanding of climate content as well as implementation and alignment approach among MNRE officials is of utmost importance to achieving CCMP implementation. The training on “Strengthening the Capacity to Integrate Climate Change Policy into Planning Process” promoted knowledge exchange and common understanding on climate change among MNRE officials. For two days, the MNRE staff were introduced and trained by the expert the content of climate change, CCMP targets and measures, climate policy integration approach through this customized training programme. Participants learnt how to align their sectoral policies with the targets of 20-year national strategy and CCMP through the small group discussions. On behalf of the German Federal Ministry for the Environment, Nature Conservation and Nuclear Safety (BMU), GIZ is working closely with Office of the Natural Resources and Environmental Policy and Planning (ONEP) in building the capacity, both horizontally among the relevant ministries and their central agencies, and vertically between central and local authorities in mainstreaming climate change policy into their provincial development planning. This training is organised by the Climate Policy Project under the Thai-German Climate Programme (2018-2021). Part of the support includes national policy development, sub-national implementation, advice on MRV, and financing. In July 2015, the Climate Change Master Plan (CCMP), formulated by ONEP, was approved by the cabinet as the national climate policy framework for addressing climate change. The CCMP specifies a set of mitigation, adaptation and capacity building targets for the 2015-2050 period. It is with the aspiration to propel Thailand to become a climate change resilient and low-carbon development society.